I recently had my sixth series of prolo therapy injections and thought it was time to provide and update. One of the reasons I hadn’t written earlier was because during this time, a myriad of events have occurred with my son who, it turns out, has severe osteo arthritis in his ankle. He’s had pain in his foot and ankle since he began walking 17 years ago. We’ve sought out answers and remedies all this time but were unable to provide him with anything but temporary and only partial relief. Thankfully, because of my association with Dr. David Harris, we were able to find an option that might potentially be the answer we were praying for. You can read about it in my upcoming article Adventures in Prolo Therapy Part 3. I’ll tell you right now, it’s not prolo but something else that we are using. Now back to me and my experience with prolo. First and foremost, I want to say that I know that everyone has their own experience and I’m not in any way suggesting that mine will replicate yours or that you will have the same results if you do what I do. It’s simply my experience and my methodology that I’m sharing. Back in April I’d had my fourth series of injections and I’d already noted that while the differences were somewhat subtle, I was feeling progressively better and that I was able to begin strengthening the areas that had been injected. I’d noticed, too, that I might feel better after the initial flare and that the pain waxed and waned for several weeks. It seems to take me a full month to feel the positive effects of decreased pain and increased strength after the injections. It’s now June and I just had my sixth series. I’ve gotten better for certain. My level and frequency of pain has diminished. Yes, I still have times when the pain rears up but I am, on the whole, much better than I was. And I’m able to manage the pain I do have much more easily. Is it perfect? No. I can’t say that getting between 50-100 injections every six weeks followed by a flare of pain for a few days is wonderful. But if it’s a means to an end or even a means to some degree of relief, it’s worth it for me. Let me say this too: I did everything I knew to do and did a tremendous amount of research before I started Prolotherapy. It was an easy decision by the time I’d come around to making it because the only other options left were surgical and they didn’t make sense at all for my situation. The key for me has been to address the issue with Dr. Harris from as many specific angles as possible. As a longtime bodyworker, my palpation skills tend to be more developed than the average Jill so I can pinpoint areas of weakness, pain and dysfunction and then direct Dr. Harris’s angles of injection. This is not to say that Dr. Harris isn’t capable of locating these areas himself. Rather, I feel our combined effort is a way for me to participate and get as much from his expertise as possible. In my particular case, and I suspect in many others, it’s not just that there is some underlying damage; it’s that there is associated weakness and compensatory over use in adjacent structures that is causing my particular brand of pain. I did have several injuries so this was really a no brainer. Keeping that in mind, I always follow up my injections with repeated stretches and heat. Then 2-5 days later I get a bodywork session and start strengthening the areas. Movement encourages the flow of oxygen and blood to these areas that are hard to reach. (That’s why they are problematic in healing in the first place.) I also take a few different supplements continuously and stay away from NSAIDs. All of this helps to move my body through the healing progression and increased comfort. There is a lot of thought going into what Doctor Harris does and you can greatly assist your healing in the ways I mentioned and several others depending on your specific situation. As with everything in life, only you can decide whether this route of medicine is appropriate for your situation. For me, it has been invaluable and the best solution to a long term problem with few remedies. Interestingly, within the last month, I’ve found another helpful and unique therapy and I’m investigating it as well. I’ll have more on it when I gather enough information to share. 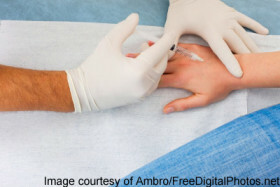 Be sure to read Part 3 for information on another form of injection therapy with Dr. Harris.